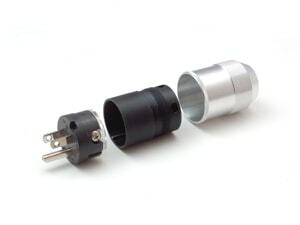 The basic material for the Oyaide M1e European Schuko connector is Beryllium Copper, which provides maximum conductivity, strength, and a secure contact. For the body of the Oyaide M1e Schuko, Oyaide has chosen high density PBT, mixed with 30% glass filler. This combination was used to maximize rigidity, thermal stability and provide high resonance absorption. The inner housing is Delrin, while the outer shell is made from a 50 series aluminum alloy. 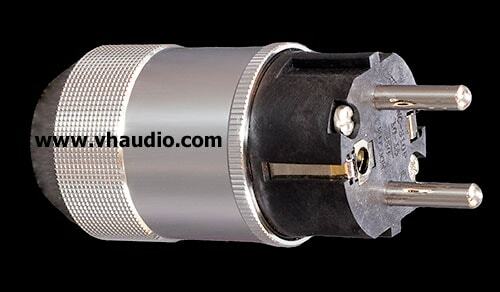 In our experience, and based on the feedback of our customers, the Oyaide M1e male European Schuko AC connector has a tonal character that is very natural sounding, resolving, and very balanced throughtout the frequency spectrum. Highs are sweet and extended, mids are layered beautifully, and bass is rock solid, without being lean or suffering from any bloat or note overhang. Soundstaging is second to none, especially when mated to the Oyaide R1 receptacle and Oyaide WPC-Z carbon fiber plate and aluminum frame. Reserve this connector for only the best cabling and most revealing, musical systems.